This ScreenShot was inspired by Chu99g’s My Favorites – Part 1 BLACK! I just couldn’t resist…I LOVE the color black. Well, hope everyone enjoys…comments are always welcome…even the bad ones. Props to the artists, they make all this possible. Great shot! And thanks for taking the time to provide the links. Wish everyone would do something like that. WOW. looks great. 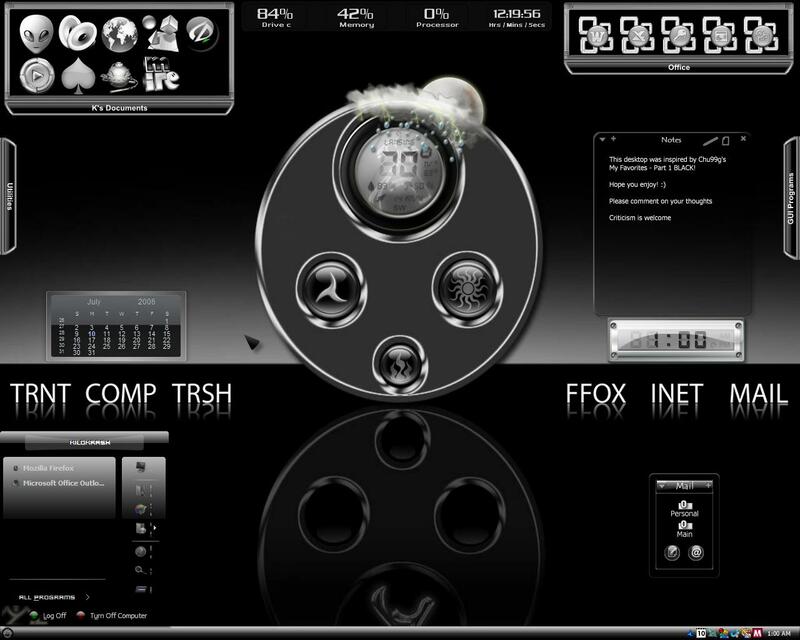 love your layout and how you incoporate the object in the wallpaper with your desktop icons. it looks like they belong there. sweet. i have 1 question, where did you get the TRNT COMP TRSH ect... what program is used? I love that look with the reflection. Thanks to everyone! Mr. Darthholmes, I used Reflections dock icons (see link above). To place them, I just used a simple Zoomer Dock...from ObjectDock of course. Once you set the dock in place, just open properties, then set the dock to transparent. Voila! Again Thanks everyone! Great shot...maybe next time add Samurize (ha, just joking). Good job including many elements of customization, 5 star effort for sure! Thanks Fairyy~, TtownTony! Actually TtownTony, the original name was "The Plethora Plague" I needed to use AveDesk for the weather and icons on the center piece. I also read an article posted on WC about the SS uploads and how people don't like to see clear desktops...they feel you should show off the work in it's entirety. So that's what I tried to do. This is only my fifth SS, so it's all a working progress. Maybe next time all incorporate Samurize... Thanks Again! Congrats on the "Daily Shot"
The links for this one must have kept you busy! TtownTony, Fairy~, windoe, seapup, Thanks Much! Although, I was away, so I didn't actually see it.